The village fell runners, Heptonstall Hurriers, would like to invite the whole village to a great day outdoors on Sunday 18th March. 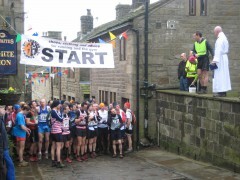 Heptonstall Fell Race is a tough 15 mile run with 3000 feet of ascent. This event is now a popular event in the fell running calendar with runners travelling from miles around to enjoy a day in the beautiful setting of our ancient village and surrounding landscape. We hope as many villagers as possible will be out on the day to enjoy the atmosphere. This will be a big day for the village with hundreds of visitors arriving from across region. The event will raise funds for the church, scouts, and mountain rescue. Spectators can enjoy the start at Weavers Square between 10.25 – 10.30 then cheer in the finishers in the fields off Town Field Lane (with marquee shelter) from 12.50. There will be cakes, soup, and hot drinks provided by the church. See you on March 18th.